In the business world, location is everything. To grasp the vital connection that St. George’s and its various “bridging” ministries provide on behalf of the entire Church, one must first understand where Christ planted this parish. Here on the South Texas border, international river bridge crossings are a vital component to daily life and culture, evening newscasts and the local economy. La frontera in Spanish, this unique region is interlaced with complex national, historical, geographical, linguistic, and spiritual paradox and juxtaposition. Although officially part of the United States of America, in “real life” the region is neither like the rest of the state of Texas and its vast southern ranchlands, nor like the border region of northern Mexico. Most of the local population remains Roman Catholic, with some strong Protestant sectors and, as everywhere now, the more radical, door-knocking cults. The Orthodox population in the Valley remains widely varied in its ethnic backgrounds and national origins. There are Greeks, Lebanese, Romanians, Russians, Ukrainians, Serbs, Bulgarians, Ethiopians, Mexicans, and more. 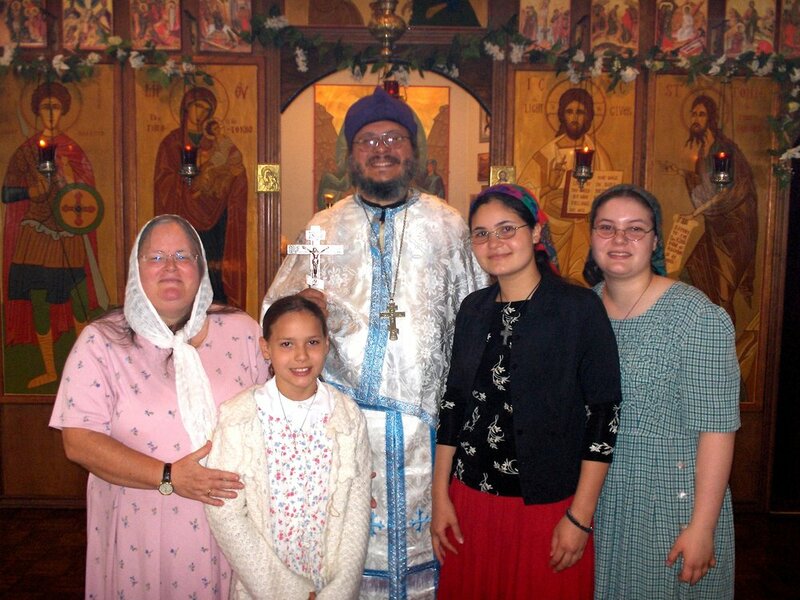 About half of the members of St. George’s are converts to Orthodox Christianity. St. George’s Orthodox Church, the only Orthodox church in this region, draws its parishioners from Brownsville, on the Gulf Coast, to Rio Grande City. The Orthodox church nearest St. George’s is in Corpus Christi, a three-hour drive up the coast from the Valley. Needless to say, St. George’s is isolated from local Orthodox fellowship and support. Despite and perhaps because of this, St. George’s and its affiliated ministries attempt to be a regional bridge for Orthodox Christianity—a bridge that goes both ways—from north to south and de sur a nortÃ©. This vast and challenging fronteraregion in which God has placed our parish and people is ripe with opportunities for Orthodox witness, outreach, and ministry. Each Theophany season for the past 30- plus years, Archbishop Dmitri, of the OCA’s Diocese of the South and Hierarch of the Exarchate of Mexico visits our OCA Cathedral of the Ascension in Mexico City. For the past several years, accompanied by his older daughters, Fr. Antonio has joined Archbishop Dmitri, Bishop Alejo, Auxiliary Bishop of Mexico and many clergy and laity from the Mexico City area who gather during this annual celebration. This past year, many new and used icons and some liturgical items were donated to the Church in Mexico by people throughout the United States. These were collected by the Perdomo family, packed up, and hand-delivered to Archbishop Dmitri and Bishop Alejo at the Theophany gathering. Icons were later distributed by Bishop Alejo for use in various mission churches and new missions developing throughout Mexico. Photos of the 2006 icon distribution can be found at: http://www.stgeorgepantry.org/iconbridges.html. Hidalgo County, Texas, is located on the Rio Grande right on the Texas border with Mexico. It is one of the most financially challenged counties in the entire United States. Fr. Antonio arrived in the Rio Grande Valley to be the pastor of St. George’s Church in January 2002. Soon it became apparent that the need for food and other assistance was very great indeed, as testified by the frequent requests for food from those who came both to the church and to his nearby home. St. George’s Food Pantry was created as an organized response to better serve those who already came to the church hungry and in need. Within a few months, St. George’s Food Pantry grew, primarily by word of mouth. It now shares with more than 50 families each time it is open. Unlike food ministries elsewhere that primarily serve the needs of the homeless, St. George’s Food Pantry for the most part assists recent immigrants and the unemployed or underemployed people who need some help making ends meet or in starting their new life in this country. Most of our Food Pantry clients speak Spanish and very little English. Most of the food distributed is purchased from the Food Bank of the Rio Grande Valley, whose website is: http://www.foodbankrgv.com, at a cost of only 14 cents per pound. In addition, food gathering and fund-raising is accomplished through St. George’s International Bake Sale’s inclusion of a “Give a Can; Get a Cookie” component for collecting canned foods (see: http://www.stgeorgepantry.org/giveacan.html). Local businesses and residential retiree communities have also been collection sites for canned goods. However, we long to make this a truly Pan-Orthodox effort! We pray for “partners” within the Orthodox Christian community - parishes, individuals or families, youth and college groups - within the region or on this North American continent. Some current “partners” make regular, monthly donations, deducted directly from their bank accounts. Even $25 a month is extremely helpful! Other donors mail in checks when they can. Setting up a simple food pantry such as the one at St. George’s is quite easy, taking only a small up-front cash investment and minimal staffing. Few Orthodox missions or parishes in the U.S. have any legitimate reason not to create some sort of food pantry ministry. We can use the help of others, especially bilingual Orthodox Christians, who want to help us continue to create, develop, and host this youth outreach ministry as a long-term service to the Church. Let us know if you have questions or are interested in helping out or in attending a future youth activity. Mother Navidad is the Mother Superior of a group of Catholic Sisters of Charity. They operate a girls’orphanage and shelter in Reynosa, Mexico. The orphanage cares for more than 80 girls ranging in age from 4 years or younger to 23. The reason for the visit was to deliver food, clothing, school supplies, sewing materials, and Christmas candy which filled the Perdomos’ truck and the Shepherds’ car. These items and other donations are collected by church members and the local community in Pharr year-round. Donations are delivered whenever enough has been collected to justify the cross-border trip.“We always make at least one trip around Christmastime and another after Pascha ,” Fr. Antonio said. In addition, some people from Kansas have provided a school bus, sewing machines and the means to pursue construction projects over the years. In fact, many of the buildings in the orphanage’s compound exist only because of donations of labor and materials of winter Texans from the Rio Grande Valley and other volunteers who have given of themselves over time. The purpose for all this is, of course, to benefit the girls who live at the orphanage. “We try to teach each girl how to take care of herself, give her an education and a trade while she is here so she can have a chance when she leaves us,” said Mother Navidad. So in addition to school, the nuns use the bakery to teach all the girls commercial baking. The products they make are sold to nearby factory workers and others. With the sewing machines, materials, and supplies that have been donated over time, the nuns have set up a large sewing room where the older girls learn how to sew. In addition to clothing projects, the girls design, cut, and sew matching bed covers, pillow shams and other accessories for the dormitories. The OCA’s Christ the Savior Cathedral in Miami has long kept republishing and making available Orthodox liturgical services that were translated into Spanish for the Exarchate of Mexico back in the 1970s. In addition to this resource, we regularly add internet links and sources for Orthodox services, lives of saints, and connections with various churches and jurisdictions in Mexico, South and Central America, and Spain. In the future, we hope to have both a source bibliography and a steady stock of Spanish-language Orthodox services and materials available for sale and ready for shipment. We accept donations to help print Orthodox materials in Spanish. We could use website help, from an intern or other volunteer, especially one who can read Spanish. Many more materials need to be translated and published. In future years, we pray to organize and host an international Orthodox Christian conference for those serving in Spanish-language settings and ministries. Let us know if you would like to help or participate! A mission-minded but small parish with limited financial resources, St. George’s welcomes assistance from short- or long-term internship volunteers. Assistance is needed in all of our various ministries, including continued work on the website, St. George’s Food Pantry, visits to Mexico and much more. An internship of a few weeks, months, or even years, living in the bilingual borderlands, is an excellent experience for a service-minded Orthodox student of Spanish, a seminarian or pre-seminarian student, or a retiree who would like to spend a period of time in full-time or part-time volunteer service to the Church in this region. Unfortunately, there is currently no funding presently for interns. They would have to assume all of their personal expenses. Winter Texans Wanted: Turn Winter Retiree Vacations Into an Adventure! Orthodox Retirees—You are invited to turn your winter vacation into a winter adventure… in service to Christ and His Church! You don’t have to join the Peace Corps or travel to a foreign nation to help with the vital missionary and ministry work of the Church. If you are an Orthodox Christian retiree and like to leave the colder parts of Canada and the U.S. for warmer winter regions, consider making your winter holiday a gift of sharing and service to Orthodox parishes and service projects this or any year! Contact Information: How Can I Help? For answers to questions or for more information, to become a “partner,” make financial or other donations, share icons or liturgical supplies, or to discuss ways your parish can create similar programs, contact Fr. Antonio Perdomo at: 956-781-6114 or 781-2388 or by e-mail at padreantoniop@aol.com. Mail inquiries c/o St. George’s Orthodox Church, PO Box 667, Pharr, TX 78577. To mail packages, please DO NOT SHIP to the PO Box! Rather, send parcels c/o Fr. Antonio Perdomo at: 520 W. Rosemary Ave, Pharr, TX 78577. Elizabeth Perdomo is the wife of Fr. Antonio and is active in the ministries herself.